View - 952-54 N Denny St. 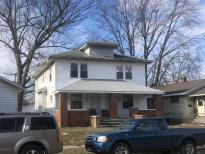 This 2 bedroom per side double is located in an area of nice homes. It has a great investment potential and should receive gross rents from $900 to $1,000 per month. 954 had someone living in it during Febuary 2003 - 954 gutted ready for rehab. Don't miss out on thig great investment opportunity.